The lively and colorful city of Bodrum is situated on its own peninsula, the city that never sleeps, second home to the Turkish rich and famous, decorated with over 30 bays and coves; and a prime location to embark from on a private blue cruise Bodrum holiday in Turkey. It’s not just about the natural beauty and entertainment in Bodrum. This exciting city offers a vast history, dating back to the 12th century B.C. As the history books have it, Bodrum was once known as ‘Halicarnassus’; the birthplace of Herodotus – the ‘Father of History’ who lived in the 5th century B.C. Visitors can visit the ‘Mausoleum’ of King Mausolus from 350 B.C. – a historic place known as one of the Seven Wonders of the World. There is only one structure that survived from the Classical Era. The Amphitheatre is one of the oldest theaters in Turkey. To this day, the Amphitheatre provides a capacity for 13,000 spectators and continues to host a variety of concerts for the lovers of art and music, in Bodrum. Another place of interest found in Bodrum that should be visited when you arrive, is the famous landmark of the city seen in just about all the Bodrum photos and postcards. It is the ‘Castle of Saint Peter’ and one of the best preserved pieces of architecture with a history that goes back to the Middle Ages. One other must-see in Bodrum is ‘Myndos Gate’. It was Alexander the Great who entered Halicarnassus through these historical gates. On the first day of your yacht charter Turkey vacation, you will be transferred from the Milas Airport – a mere 40 minutes’ drive. After which time you will be greeted and taken to board your Bodrum yacht charter. From Bodrum harbor, you will step on board your charter boat around 3:30 pm. This is the get-to-know the crew with welcoming drinks, tour the boat, and settle into your accommodation kind of day. A lovely dinner will be served while anchored at the harbor followed by leisure time and an overnight stay. On this day is when your Turkish blue cruise begins. After a delicious Turkish breakfast, you will be informed about the cruise itinerary and learn more about the gulet boat. The first stop is Orak Island. Here you will have the opportunity to go for a swim in the crystal blue waters of the Aegean in Orak Island, followed by leisure time and the pleasure of a delightful lunch. The next destination will be to cruise to the town of Cokertme. This is a small and picturesque fishing town where you will enjoy more leisure time and watch the beautiful sunset during your Mediterranean dinner. After dinner time, you are free to do as you please. There will be an overnight in the peaceful surroundings of this region. During the early morning hours, your private yacht charter will cruise to the Seven Islands. Breakfast will be served while you experience another excellent day in this area. The islands’ region is full of many small islands and coral reefs. It is a great idea to go diving, swimming and lounging plenty while you are here. You and your group can also go for a lovely walk in the pine forests. The first anchorage in the Seven Islands will be Kufre Bay to later anchor at Uzun Liman (Long Port) for another great dinner and then spend the night in peaceful and breathtaking natural scenery. 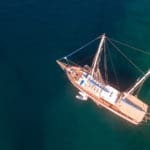 Today is another day of leisure where your gulet will be anchored at Tuzla Bay to enjoy a swimming break in the turquoise waters of the Gulf of Gokova. Morning swims before or after breakfast, may become a part of your daily activities. A beautiful lunch will be enjoyed in the paradise of Longoz Bay, sheltered by huge pine forests. Here you have the choice to go ashore and take a nature walk to take in the fresh pine and sea air. This same day, your gulet will cruise to the charming little Karacasogut village for dinner and to spend another peaceful night in blissful surroundings. Since this lovely village is located a mere 25 km from the city of Marmaris; it is possible to do some sightseeing in the colorful and lively city of Marmaris via a local minibus ride. Another fantastic day ahead awaits where your captain will cruise to Sedir (Cedrae) Island. This unique island with its small beach and impressive clear waters is like an open air museum. You can visit the city walls of the ancient temple from the time of Dorians’ reign which was later restored as a church. Also in this area is an amphitheatre with a capacity to host up to 1,500 guests – along with vaulted historical buildings. Feel free to walk around to take some photos or videos of the pillar ruins with the antique writings and the ancient stones decorated with reliefs. Cleopatra Beach is located on this island. The sand found on this beach is believed to only be found in the deserts of Northern Africa. According to a myth, King Antonius brought the sand for Cleopatra, all the way from Egypt. 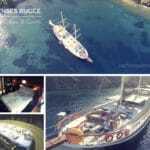 Later your gulet cruise will set course to Ingiliz Limani (English Port) for dinner and an overnight stay. The port got its name from the time of 2nd World War when the ships of English Navy forces used to dock here. In this area, there are so many small and large bays which are suitable and sheltered enough to anchor for the boats during many types of weather conditions. The gulet will be cruising in the morning while you will be having breakfast on the way to Kargili Bay located in the Gulf of Gokova. Shortly after arrival, you and your group will have a leisure time in this area for swimming, snokeling and simply doing as you please until lunch time. Once you have completed a lovely lunch – possibly after working up an appetite, your private charter yacht will then be setting course to anchor at Kisebuku Bay (Alakisla Buku). With a short trip to land, you will have the chance to visit some ruins left from the Byzantine times. Continuing a lovely relaxing day, you will be having dinner with a new sunset, and spending the night in this charming little bay. Today is your last full day at sea. A few lovely destinations will be visited. After another lovely breakfast and leisure time, your captain will cruise to Pabucburnu where you will later enjoy a refreshing lunch here. 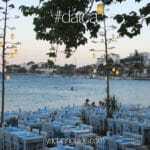 When tea time arrives, you will be in Yaliciftlik Bay, Bodrum. This is a charming little town on the Bodrum peninsula. You have the choice of going ashore for a village tour to see the local village life. 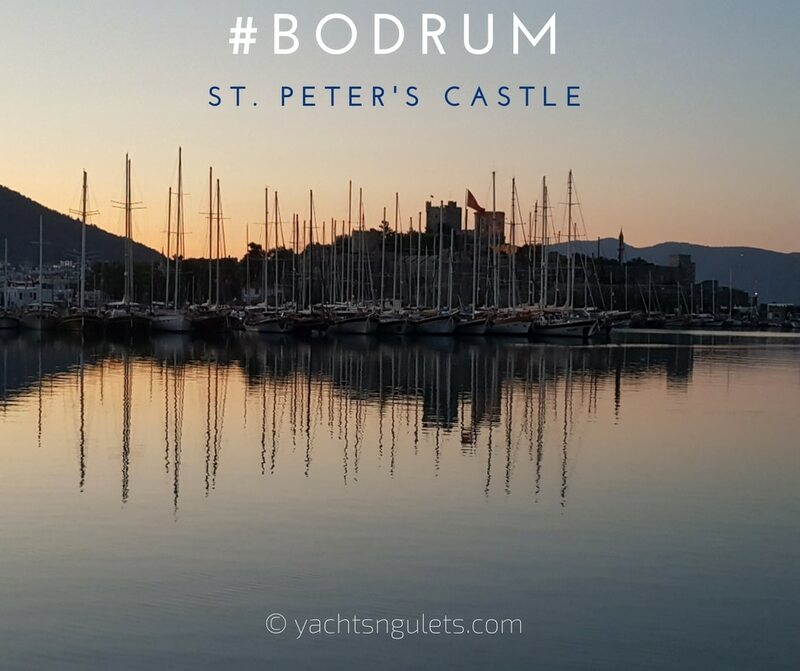 As this is your last night on board, your Turkish charter boat will be cruising back to Bodrum Port for dinner and an overnight stay. After dinner, it might be a nice idea to go out sightseeing in the immediate area of the harbor, pick up last minute gifts and souvenirs from the marketplace and enjoy your last night in Bodrum. 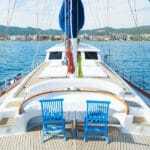 You will wake up with an amazing view of Bodrum harbor, and then have your last breakfast on board your private gulet. Shortly after breakfast, it will be time to disembark with hopefully one of the best holiday memories ever!